Organic, rich and weed free. 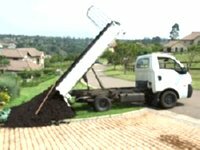 This course compost is ideal to replenish nutrients and acts as a mulch. A garden, as a living mini-ecology, needs a nutrient top up to avoid the soil becoming leached and sub-standard. Buying in bulk loads saves you a great deal and your garden will love you for it!